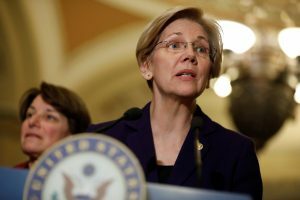 WASHINGTON — U.S. Sen. Elizabeth Warren says she’s “troubled” by reports that former President Barack Obama will be paid $400,000 to speak at a September health care conference put on by Wall Street firm Cantor Fitzgerald. The Massachusetts Democrat said Thursday on SiriusXM’s “Alter Family Politics” program that she is concerned about the overall influence of money in politics. Obama spokesman Eric Schultz says in a statement that the Democratic former president accepted the invitation to speak because health care is “an issue of great importance to him.” He added that Obama implemented financial reforms even after taking money from Wall Street as a candidate in 2008. Schultz says Obama will be true to his values and record “regardless of venue or sponsor” for his speeches. Left: Sen. Elizabeth Warren (D-MA) speaks with the media following the Democratic policy luncheon in March on Capitol Hill in Washington, D.C. Photo by REUTERS/Aaron P. Bernstein.